This was my first Billy Boyle mystery and it certainly didn’t disappoint! Classic sleuthing, from the days when honor was a duty. WWII offers the perfect menacing backdrop for the murders and racial injustice. I’m hooked! March, 1944: US Army Lieutenant Billy Boyle, back in England after a dangerous mission in Italy, is due for a little R&R, and also a promotion. But the now-Captain Boyle doesn't get to kick back and enjoy his leisure time because two upsetting cases fall into his lap at once. The first is a personal request from an estranged friend: Sergeant Eugene "Tree" Jackson, who grew up with Billy in Boston, is part of the 617th Tank Destroyers, the all-African American battalion poised to make history by being the US Army's first combatant African American company. But making history isn't easy, and the 617 faces racism at every turn. One of Tree's men, a gunner named Angry Smith, has been arrested for a crime he almost certainly didn't commit, and faces the gallows if the real killer isn't found. Tree knows US top brass won't care about justice in this instance, and asks Billy if he'll look into it. But Billy can't use any of his leave to investigate, because British intelligence agent Major Cosgrove puts him on a bizarre and delicate case. A British accountant has been murdered in an English village, and he may or may not have had some connection with the US Army—Billy doesn't know, because Cosgrove won't tell him. Billy is supposed to go into the village and investigate the murder, but everything seems fishy—he's not allowed to interrogate certain key witnesses, and his friends and helpers keep being whisked away. Billy is confused about whether Cosgrove even wants him to solve the murder, and why. The good news is the mysterious murder gives Billy an excuse to spend time in and around the village where Tree and his unit are stationed. If he's lucky, maybe he can get to the bottom of both mysteries—and save more than one innocent life. "One of Mr. Benn's best books of the series...A pleasure to read." "Pervasive racism in the U.S. Army during WWII frames Benn’s excellent eighth Billy Boyle whodunit...The superior plot and thoughtful presentation of institutional racism directed against American soldiers about to risk their lives for their country make this one of Benn’s best." "Elaborately plotted, Benn's eighth entry in the series (after Death's Door) has his World War II sleuth investigating a deplorable side of U.S. military history, His use of an ongoing narrative throughout the book to explain Billy and Tree's backstory is particularly well done." "Benn doesn’t skate around the issues of race relations and segregation in the 1940’s; he dives courageously in with both feet.... With A BLIND GODDESS, [he] has served up yet another delicious mystery to sink our teeth into—no way to ration this one." 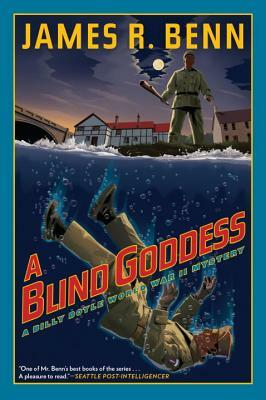 "A Blind Goddess hits hardest when it examines the issue of internal racial politics during WWII... another fine, and recommended, book in a continuing series of Benn’s intriguing historical novels." "A fast-paced saga set in a period when the fate of civilization still hangs in the balance." "Captivating.... Benn does a superb job of simultaneously capturing the personal anguish of war and creating a splendid adventure novel." "Benn's Billy Boyle mysteries are always entertaining, filled with riveting characters, and beautifully plotted stories." "The Billy Boyle, World War II mysteries are among the most consistently well written and researched crime novels published today, and are highly recommended." "If you like WWII mysteries, here is a must-have series."